ZWILLING Pro is the most user-friendly knife available to market. The unique blade shape and ergonomic bolster are the result of 280 years of experience in knife making, and the rigorous study of how knives are used. A unique curved bolster supports the professional pinch grip, with thumb and index finger on the blade, for safe cutting and less fatigue. The blade was redesigned with a broader curve in the front to facilitate the rocking motion of Western cutting, while the straight back is ideal for the Asian chopping motion. The full length of the blade can be used when cutting and can be sharpened from bolster to tip Designed in Italy by Matteo Thun and made in Germany by ZWILLING J.A. Henckels, the company that sets the standard for exceptional cutlery worldwide. 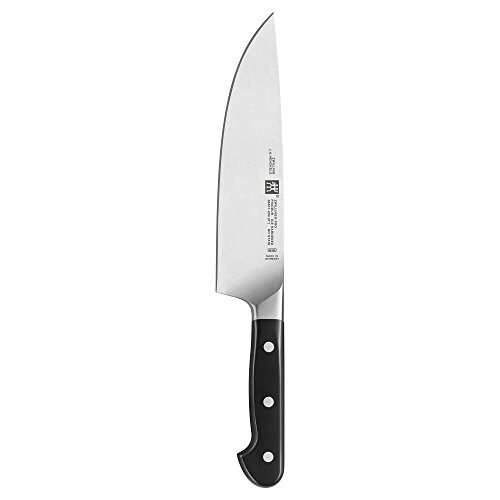 The ZWILLING Pro Chef's Knife is the workhorse of the kitchen. Whether chopping, slicing, or dicing, the broad blade and comfortable, balanced size will quickly become the go-to knife for everyday tasks.